Hi everyone. Tonight I wanted to tell you about a Colouring Notebook that I purchased on a whim; I saw this video and promptly went to the link and ordered one. I don’t do that too often but I just had to have one. I have been watching JournalJoy’s videos for a while now and always enjoyed them. A few times I have been tempted to buy a notebook she has reviewed but usually the companies either do not ship internationally or the shipping is prohibitively expensive. But this time everything was in my favour; Colouring Notebook ship internationally and right now the price is only $14.95 US! 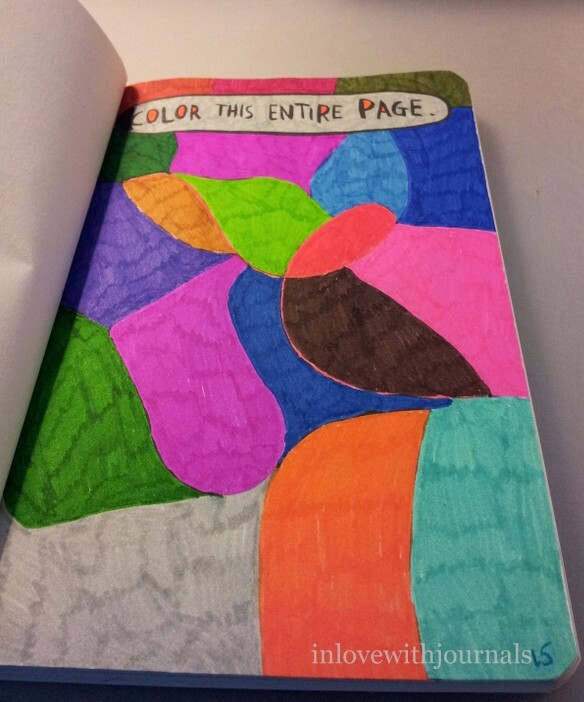 You can order one yourself at https://coloringnotebook.com/. You can choose blank, lined, or dot grid. Mine arrived in a little over a week. The postmark on the package said Ukraine. I have some adult colouring books which I use on occasion but as soon as this arrived I started colouring in it right away. The 100 gram paper is very smooth and creamy. There are about 50 beautiful illustrations in it, interspersed with lined pages for writing. I will not be using my fountain pens in it due to feathering, as mentioned in the video. But my gel pens look fantastic in it, for writing or for colouring. I used my Staedtler Triplus 0.5mm markers for colouring and there was no bleed through. I’m thrilled with it and would recommend it for a Christmas gift or a treat for yourself. 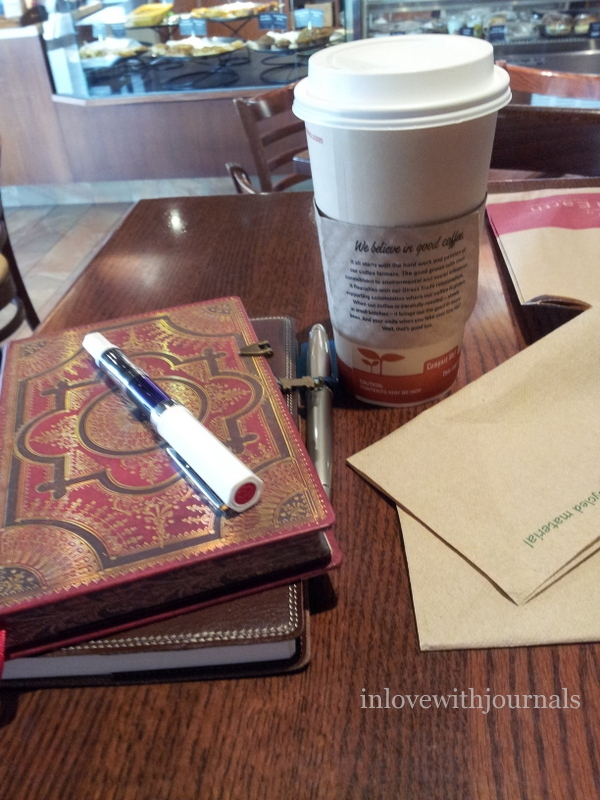 It adds a new dimension to your journaling. I didn’t post any pictures of mine as I thought the video did a wonderful job. And the second thing I wanted to talk about was the Hannah Braime Becoming Who You Are Advent Calendar. I get weekly emails from Hannah and her site is an amazing resource for journal writing and self-awareness. Her articles and classes encourage authentic living with compassion and courage. Her weekly emails are free for subscribers, as is her library with tons of thought provoking material. I recently became a subscriber over at Jamie Ridler Studios, mainly through finding her on YouTube, and because she was talking about a Do Good initiative she was launching called Give a Girl a Journal. And that initiative launched today. Jamie, a creative living coach, has asked journalers to share how they came to journal and why this practice is so important to them. Here is my story. My earliest memories are of pretending to write. I would find a magazine that mom and dad were finished with and I would cover the page with gibberish. 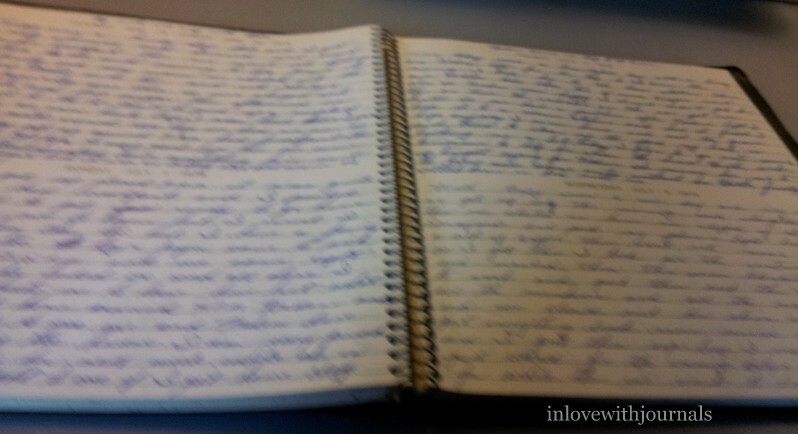 I filled in the spaces between paragraphs and around words; all of the white space would be filled with my scribbles. I felt very important and wise, writing down “words” before I even knew what they were. I saw my parents writing grocery lists, journal entries, expense reports, client summaries, letters and Christmas cards and I was determined to do the same, even though I had no clear idea what they were doing. I just knew I HAD TO WRITE. My hand had a life of its own. It still does. Once I learned to write I never stopped. I wrote stories and poems. I wrote in my diary about the wonder and pain and sharp edges of being a girl. My notebooks were my best friends because they always listened and never judged. They have been with me for every decision, every celebration, every obstacle, every miracle, every sadness and every triumph. They remain my best friends, still listening without judgement. I still write stories and poems and my notebooks are still my safe place, my world, my greenhouse, my lab, for ideas, plans and schemes. My journal is freedom, the one thing that endures. Everyone needs a safe place to meet themselves. 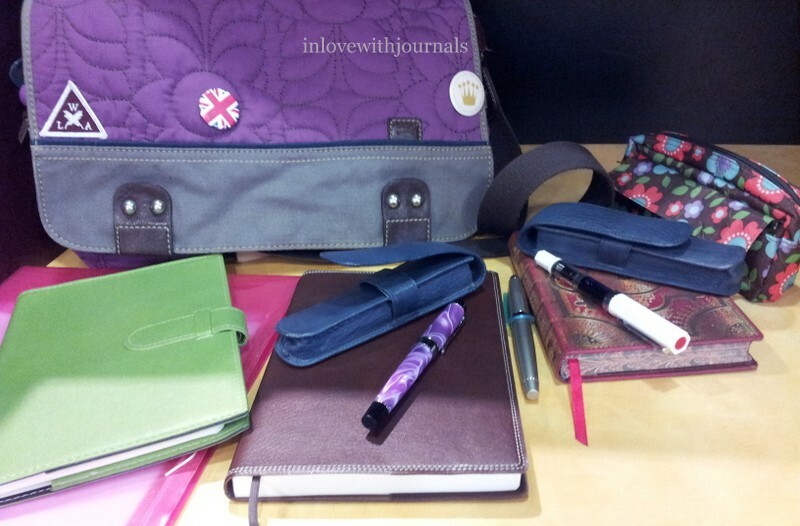 And through Jamie Ridler’s initiative, Give a Girl a Journal, we can Nominate a Girl to receive a journaling package. Or for $20 USD we can Sponsor a Journal for a nominated girl. And it’s not just girls who need this; you might remember the post I made about the young man who lives beside me who is facing life with an inoperable brain tumour. I gave him a journal because it was the best gift I could give him. Young people in our community need tools to get through the process of becoming who they are. We know the power of our journals and we should share it. Join Jamie Ridler’s campaign and give a girl a journal so she always has a best friend to hug tight to her chest, and hear her inner voice. 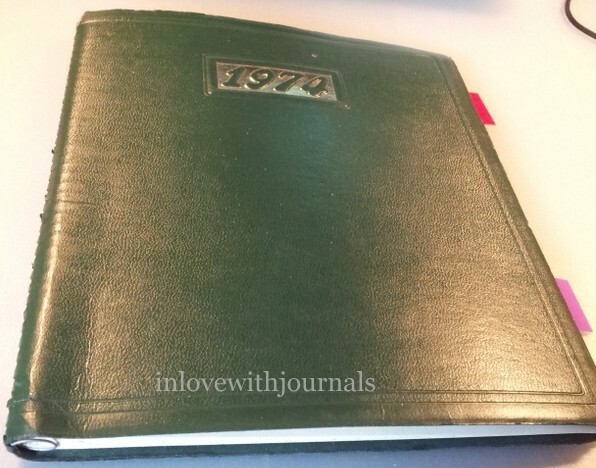 I don’t think I’ve done this before: a flip through of a finished journal. This is my Winnable Executive Journal in brown. I finished it a couple of weeks ago. I see videos of flip throughs on YouTube and they seem popular so I thought I would give it a go. My journals are fairly consistent; I rarely doodle or add ephemera so the pages are filled with my writing. So if this post is boring let me know and I won’t make you suffer through another. 🙂 At the same time this is a private part of me that I am sharing. I thought long and hard before opening the vault. I hope it’s useful at the very least. This is a typical page. Here I am discussing Halley (our cat) and one of her vet visits. I think this page shows my thought process on how I was going to do an ink review. I like to use different fountain pens throughout my journals. I frequently add quotes to my journal pages. I often write out articles I enjoy and want to keep. This one was on getting through panic attacks. A postcard I bought in New York. I remember we were discussing the blood moon last year, so I looked it up and wrote down the details for our region. We couldn’t see much in the end, due to overcast weather. Another article I enjoyed, this time on building up confidence and self-esteem. I printed out this breathtaking article on bookstores of the world. Just look at that staircase! Another great quote, this time with a great graphic. Another great picture I wanted to keep. Notes from the NaNoWriMo workshop at the library. So that’s it. It was difficult to find a page or even a portion of a page that didn’t have private details on it. But I wanted to share, and it was good for me to open my journal up and let it breathe in the world. I hope you enjoyed the walk through my words. A couple of random things for you today: I have two new bottles of ink and I have made some progress in my Wreck This Journal, and I thought I would share. Yesterday we celebrated my sister’s birthday by going out for lunch and then shopping at Reid’s Stationers! (She actually loves the place too; I wasn’t being selfish!) We were on an ink mission of sorts and the staff were really wonderful and swabbed a bunch of inks for us. Diamine Matador Red is really amazing; think the red flags in a bull ring, or the colour of blood – vibrant and bright. And the Sailor Jentle inks are lovely; we looked at swabs from the Colors of Four Seasons collection. My sister settled on a bottle of Yama-Dori, which is a breathtaking turquoise. 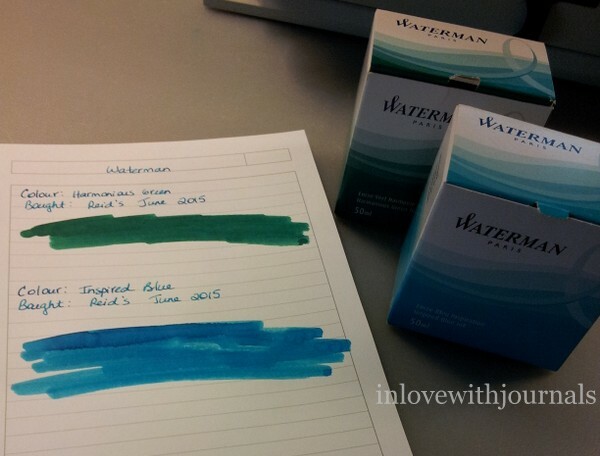 We both bought bottles of Waterman Inspired Blue, and I picked up a Harmonious Green as well. I’ve said this before but buying French ink is like buying French perfume; I feel spoiled and fancy. 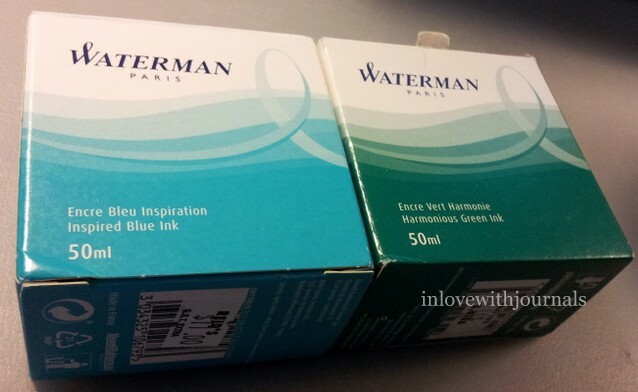 And in comparison with other inks it is affordable; Reid’s sells Waterman for $11. And they sell Pilot Iroshizuku bottles for $40. I will probably buy a bottle of Iroshizuku one of these days but at that price you REALLY have to love the ink. I should buy some samples from Goulet before taking the plunge. Anyway this morning I updated my ink journal and swabbed both of these. When we were comparing swabs at Reid’s yesterday I was struck by how bright the Waterman inks are. They swabbed the bottle of Waterman Audacious Red and I know I will never buy that ink. It’s too bright and pink for my taste. But I loved the blue and green. The blue reminds me of Bleu Pervenche by J. Herbin, which I love. It’s such a gorgeous turquoise. And the green is very close to Monteverde Green. Love them both and I know I will use them in many of my pens. This morning I was up early (those darling cats of ours!) and I started catching up on my Youtube video subscriptions. 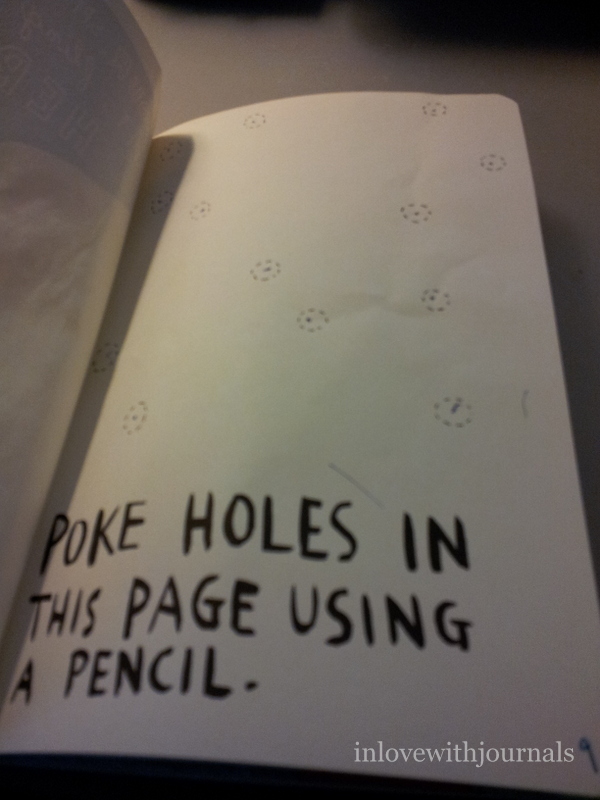 The very first video was an update on the progress made in a Wreck This Journal. So I was inspired and for the rest of the morning I worked on mine. I had so much fun! 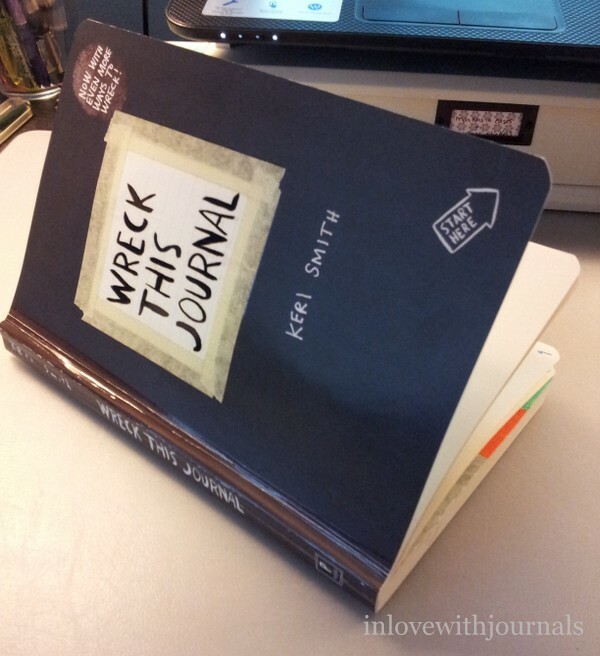 It was hard to “wreck” a journal in various ways but I managed it and it was great. I actually did this, although you can’t really tell from the picture. My feet didn’t need to be wiped and they were clean as I was inside so there’s no evidence I jumped on it, but I did. I invited David to do the same but he declined. He laughed watching me do it though! As I said, so much fun. Yup did what the instructions told me. This was the last page I completed and I’m really happy with it. 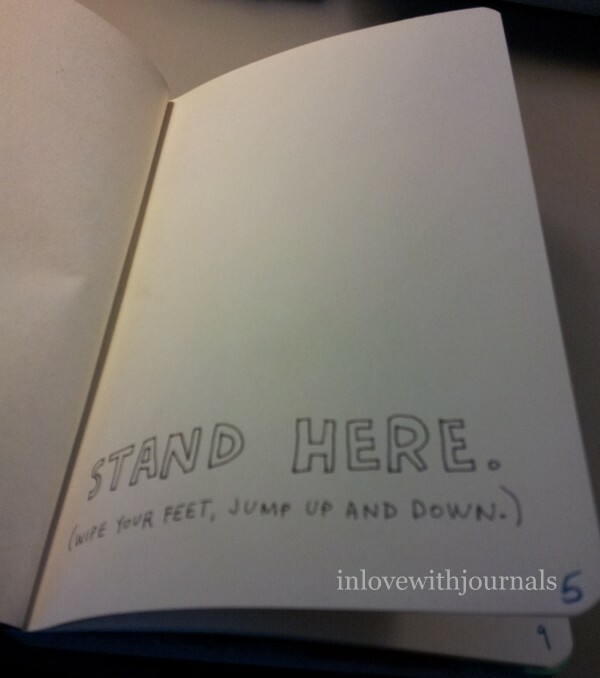 I’m feeling the effect of this journal already; much more liberated and free with journaling. Maybe I won’t be so precious with my other “fancy” journals. That’s the aim anyway. I will share more as I progress through the journals. 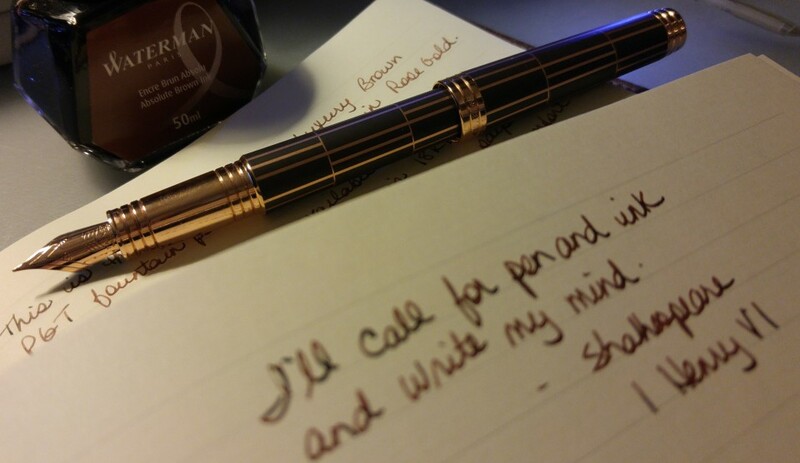 I thought I would talk about my new Monteverde Prima in Tiger Eye today but then I changed my mind. This day is always a wildcard; I never know how I will feel on the day we celebrate Mothers. I haven’t mentioned my mother’s diaries before, probably because I knew such a post would be hard to write. I did talk about her in this post from May 2014 but today as I remember her and marvel at the 15 years since her death, I find myself reading her words. For as long as I can remember my mom had a diary. They were usually coil-bound, the date stamped right on the front, with vinyl covers, the kind you buy in drug stores and Zellers in the fall and early winter, for the following year. Most of them are made by Blueline or The Brown Brothers of Toronto, and all are 8.5 x 5.5. I remember my parents discussing the weather, when we had the first frost, when we saw the first robin. And my mom would dig out past diaries and prove to my dad that she was indeed right about that Christmas it was so warm and green, or that year the power was out for 5 days straight. 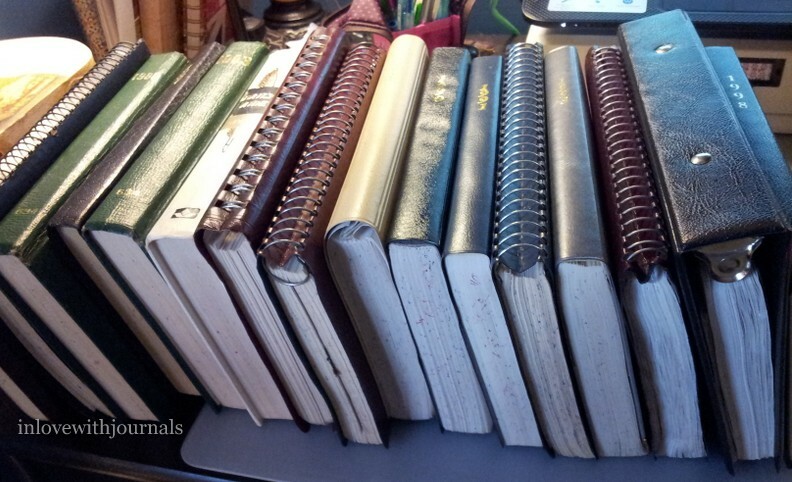 When my mother died my sister and I wondered what to do with the journals. We cherish them but how to preserve them for posterity? We might not always live in the same city as we do now. We thought about having a complete duplicate set made somehow but we haven’t done anything so far. She has a few, and I have a few. They will be placed in the Box of Things to Save in Case of Fire (that I have organized in my mind). 1974 is the first year in my stash; our mother would have been 36, I was 4, my sister 16. In the photo above page flags mark particular passages that I want to share or just remember. Or maybe copy into my own journal. Mother was very much a chronicler of events; there is no drama, no page after page of angst or indecision. Every day lists the weather, what she did, where she went, who she saw and every once in a while, how she felt. So different from my own journal writing! Over the years my sister and I have read to each other passages from these diaries, on special occasions like birthdays or Christmas. Often it is a game of “Who is that?” when a strange name is mentioned; “Where were they?” when a reference to an unfamiliar place is made; or “What on earth can she be referring to?” And often the passages are bittersweet; details of the “friendship turning into something more” of my sister and her now-husband are delightful to read, but also remind me that no such entry will ever be written about me and my husband, as she passed away before we even met. The story of our “friendship turning into something more” has been written by me, in my own fashion and I guess that pays homage to this tradition. My sister also keeps a journal, again in her own fashion that is different from mine and our mother’s. But it’s nice to know the urge to write is the same for all three of us. It’s amazing to have such an abundance of handwriting examples; one notices patterns and rhythms to the entries, and even secret codes (which we think we have figured out!) As I read them I can hear her voice in my head, which is sometimes hard but always comforting. The rest of my mother’s diaries that currently live with me. They smell a little musty still, and some of them have sticky spots (something spilled from 8 year old me, or an accidental coffee mug topple?) I would have to double-check with my sister but I believe we have a complete collection from the early 1970s to 2000. Thirty years of first snows, robins, vacations, birthdays, weddings, babies, storms and sicknesses. And love. Lots of love. Nice visiting with you Mom. Miss you. And Happy Mother’s Day.